I find Cleveland to be the most friendly of the 12 Federal Reserve districts. They do a lot of community outreach work, and have a good research department. Evidence of friendly Cleveland Fed! 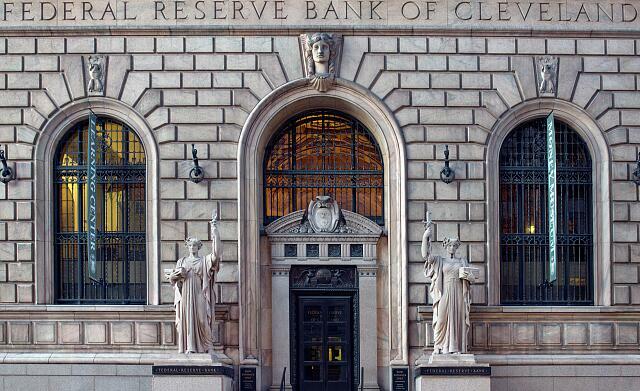 The Federal Reserve Bank of Cleveland is the headquarters of the U.S. Federal Reserve System's Fourth District. The district is composed of Ohio, western Pennsylvania, eastern Kentucky, and the northern panhandle of West Virginia. The Cleveland Fed building was designed by architects Walker & Weeks. The building is considered an historically significant piece of architecture. I like how it looks too. Apparently, few know much about the art and architecture of the building, not even in Cleveland! The building was extensively renovated about 15 years ago. The architectural and design preservation firm that did the work has some spectacular photos of the interior, which I couldn't find anywhere else. I found only one more photograph of the interior, from the Cleveland Fed's own site. All others were fuzzy, low quality images from an Illuminati conspiracy website. The irony is not lost on me. This is the entire Drawing Board series of videos produced by the Cleveland Federal Reserve. Really Bad Drawings, Real Simple Explanations consists of 16 videos, with a total playing time of 1 hour and 40 minutes. Despite being the Cleveland Fed's most popular YouTube video series (there are actually complements and requests for new videos, instead of disgruntled monetary policy rants! ), I suspect that the series has been discontinued. There have been no new entries in 11 months. Since you mentioned Walker & Weeks and the architecture of the FED you might be interested in knowing that the Cleveland FED had two branch facilities in Cincinnati(built 1926)and Pittsburgh(built 1931.) Both were lavish buildings with fine interiors and exterior architectural sculpture,and both were also by Walker & Weeks. District 4 may have had the finest group of facilities in the system. The headquarters building in Cleveland(built 1923)was designed and constructed at the same time as the magnificent New York FED. Both were conceived with the same historical precedents in mind, that being the Florentine Renaissance Palazzo; a classic Beaux Arts model for buildings of strength and permanence. I think the Cleveland FED is relatively well known around town as the work of Walker & Weeks. But unlike Severance Hall(by W&W also)there are few reasons to go to the FED so it is not experienced by many. The Pittsburgh and Cincinnati branch buildings have not remained part of the system. The Cincinnati building was sold and badly cut up for an apartment conversion...it is now called "The Reserve." The Art Deco Pittsburgh Branch is now being converted into a hotel. Regrettably the Cleveland FED exercised little care for the preservation of these buildings. One would think a public institution that makes it's own money could have found the funds to protect these buildings. Thank you so much for your excellent comment, David Gill! I searched for similar information, without success, online and even on the Library of Congress website. LOC is usually an reliable reference source. I am sad to learn of the (former) Cincinnati and Pittsburgh branch buildings status. They are irreplaceable, but that realization has yet to dawn on those who decreed their fate. When it does, it will be too late. No, it is already too late. for both buildings. I hope the Cleveland Fed will be better cared for.